Which Amarna Princess is depicted? Posted: Thu Apr 18, 2013 8:24 am Post subject: Statue Identification. Which Amarna princess is this statue (below), more likely to depict? The statue (above) is most often recognised as Meritaten or Meketaten, with the occasional suggestion that it is in fact Ankhesenamun. I originally thought and was informed that this statue (Below) depicted Tutankhamun and Ankhesenamun, though whilst reading "Amarna Sunset" by Dodson, I was informed that this statue in fact depicts Ay and his wife Tey.. Which is correct? 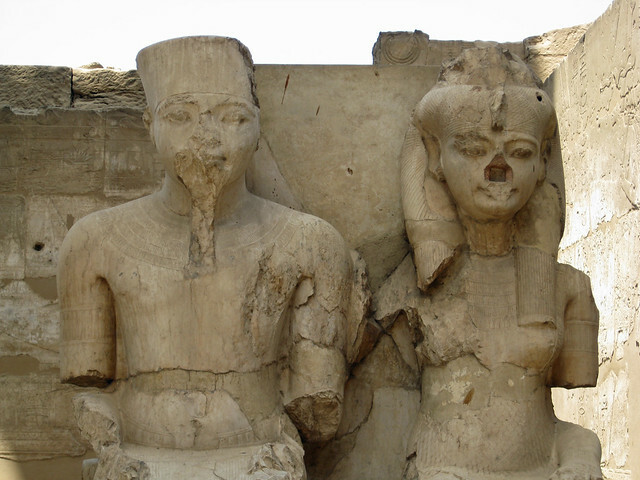 the statue was originally of tutankhamun and ankhesenamun, but taken over by ay and tey. The two dyads of Amun and Mut in the Collonade Hall of Luxor Temple were at the end of the Nineties extensively restored and reconstructed through the OI Chicago. Parts were attached again (for example one head of Mut) that were in the Cairo Egyptian Museum in the basement until then. The assignment "began under Tutankhamun, completed and placed under Ay" comes from OI Chicago, on the basis of artistical style. The statues were usurped, according to extant inscriptions on the back, by Ramses II. As for the princess, I think I read somewhere that in reliefs, the oldest of the Amarna princesses (Meritaten) tends to have a sidelock with a straight end, while the others have diagonally cut ends. If the same were true for sculpture in the round, the statue is probably Meritaten due to the straight sidelock, but it's unclear whether or not that's the case, so all we can say for sure is that it's one of the princesses. I have no proof to say this but I've always believed that this tiny statue represents Baketaten rather than one of Akhenaten's daughters. Facially, she looks to me more like a sister than a daughter of Akhenaten; and the shape of the face and pout are very similar to depictions of Tiye. The other person from the Amarna period that she resembles very closely is Tutankhamun - as Baketaten's mother is never explicitly named could she be Tut's full sister, left in Tiye's charge because her mother was deceased? Alternatively, as others have speculated the resemblance to Tutankhamun is because she is his mother. I would add to this that facially, the representations we believe to be Akhenaten and Nefertiti's daughters all to some degree look like both parents - with some favouring Akhenaten's look and others Nefertiti. This princess does not have such a blending of features (including face shape, profile and so on) - in fact she does not resemble Nefertiti at all. i think while it is easy to say art became more realistic during the amarna period, you have to remember it is also highly stylised. therefore while i am inclined to believe the nefertiti portraits found in the workman's home are realistic, i don't any of the others are true to life portraits. However I do like your theory Karnsculpture, I have never perceived the statue under that light before, nor have I recognised the similarities between this statue and those that depict Tutankhamun. As for the princess, I think I read somewhere that in reliefs, the oldest of the Amarna princesses (Meritaten) tends to have a sidelock with a straight end, while the others have diagonally cut ends. Do you have, or are you able to, post image comparisons, in order to demonstrate the difference in hairstyles between the Amarna princesses? However each statue/bust portrayed them with their distinctive (generally) facial characteristics, which is a helpful identification method, when there is an absence of a straight forward indication on a statue/bust as to who that particular statue depicts, no matter how exaggerated or stylised those particular features may be. To illustrate, Tiye generally depicted with a sour expression upon her face, famously represented by her bust. I agree that her expression does bear a certain resemblance to statues of Tiye and virtually none to Nefertiti. Here's another thought. If Tutankhamon was a son of KV55 (a son of Amonhotep III and Tiye whoever he was) and a full sister (whose name we have even less of a clue about), could this young lady be a child of the same couple and thus an unattested full sister to Tut? Of course it's always easy if you can just make people up like I just did but given the fluidity of our knowledge, and the rather spotty record of the ancient Egyptians regarding royal family members, is this possibility completely out of bounds? No, it's not completely out of bounds, though in my opinion, it's highly unlikely, though in any case, a very interesting concept... Perhaps Meritaten or Meketaten did not look like their mother, Neferteti, though more so their father and grandmother, Tiye? Is there any other similar depictions of a princess like this one? 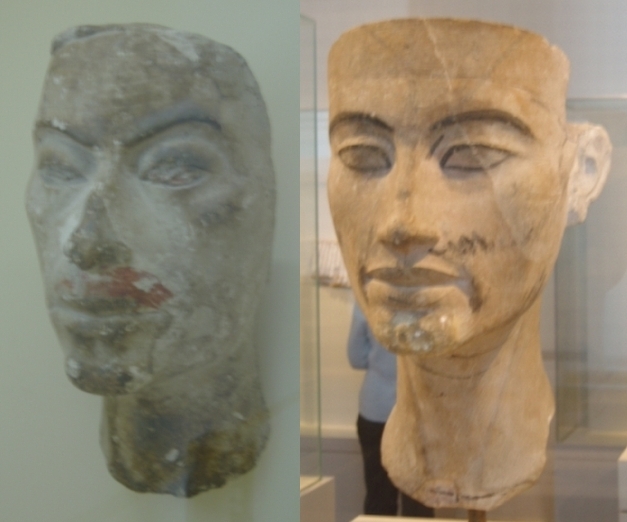 which has numerous images of various Amarna busts and statues, some of which I have never seen before! 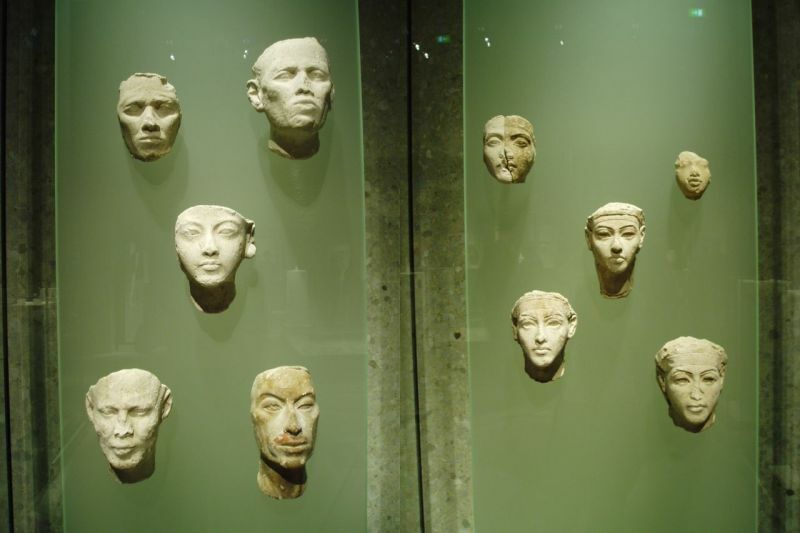 Is it possible to conclude from these plaster faces, that further on, in the Amarna period, depictions of people became more detailed and realistic? Take the image below for example, it appears as if the craftsman, took a plaster of his face, almost! Borchardt found next to the bust of Nefertiti and various heads in stone in a different state of production a number of these so-called plaster masks. Whether this is a true masks, a print taken from living people, or whether they were freely modeled is unclear. Since they were working, as evidenced by the remains of painting, very detailed one thinks also here they were models for the production of statues and portraits. I think artist studies would be also possible. Unfortunately, the pieces are unmarked. However, they clearly bear portrait-like features. As can be seen in the approach of the so called crown band, also members of the royal family are under them. The one you gave as example Aja is commonly attributed. The 'Aja' plaster mask, does intrigue me, it appears to have realistic facial features, which have not been stylized, apart from the eyes, noticeable upon some of the other plaster masks also e.g. the wrinkles upon his for-head, the uplifted eyebrows, the high defined check bones and the realistic nose, which is of interest to me the most. Artist studies does seem to be a plausible possibility... Is Aja a translation for ay/aye? ... Is Aja a translation for ay/aye? Yes. Aja or Eje are the German "versions". How is it known that the plaster mask, is that of Ay?